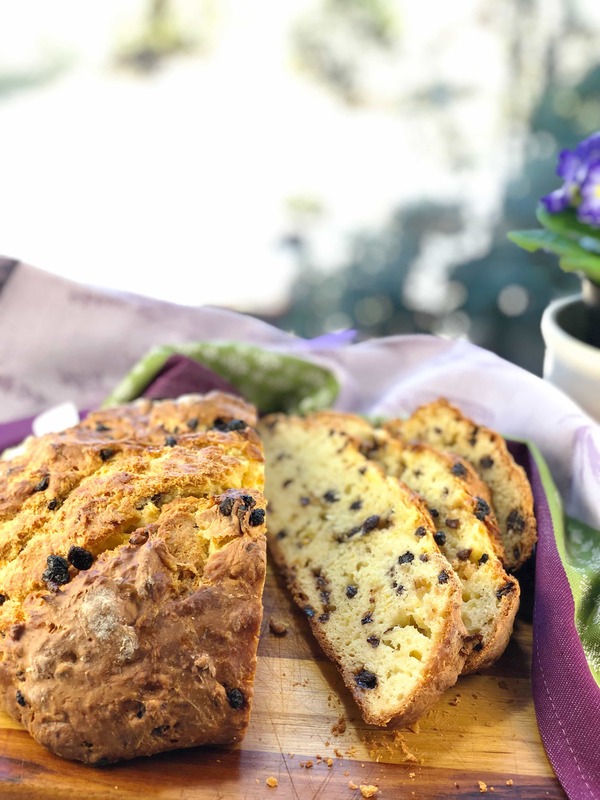 Whether it’s St. Patrick’s Day or any other day of the year, this easy loaf of the Best Irish Soda Bread will satisfy everyone! Delicous plain, warmed or toasted, or even French-Toasted! You’ve heard the saying, “On St. Patrick’s Day, we’re all Irish!” Hmmm. Well, if being Irish means we eat some corned beef and cabbage, some Irish Soda Bread and down a pint of Guiness, then, count me in! I’m pretty sure I’m 0% Irish, but this bread certainly makes me wish I had at least one ancestor from the Emerald Isle! 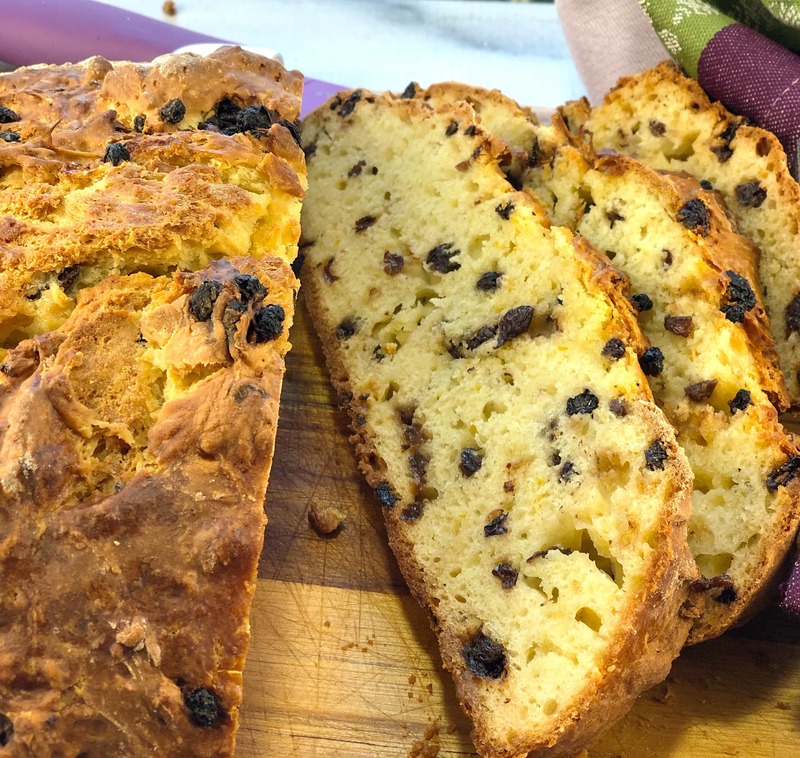 Although it came from Ireland, Irish Soda Bread may not be as steeped in history as one would think. Apparently, baking soda (aka bicarbonate of soda) was introduced to Ireland around 1840. This means this traditional loaf with the cross on top – to repel the devil – is not even through its second century. But that shouldn’t stop us from making Irish Soda Bread for St. Patrick’s Day. 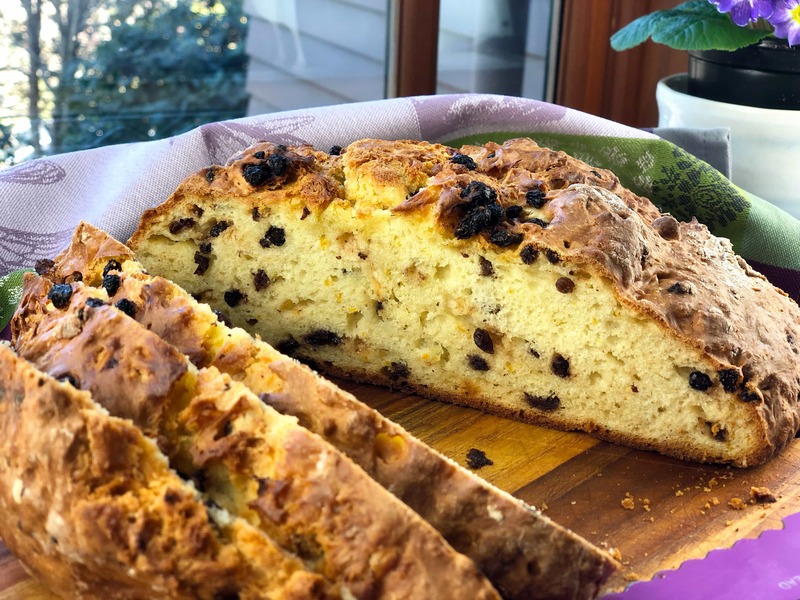 Irish Soda Bread with Currants does fall into a similar category of Scones, Biscuits and such. All of which are all quick to make and so satisfying to eat. So I’ve previously made a few recipes for Soda Bread. And none of them were as delicious (and, as deemed in my house, “addictive”) as this one from Ina Garten. Because this one contains currants, also known as “Zante Currants” or “Corinthian Raisins”, and a bit of orange zest. These lovely ingredients, together with the buttermilk and a touch of sweetness, form this magical flavor of which I just cannot get enough. Luckily, this recipe makes a good-sized loaf, which, if wrapped tightly, can last 3-4 days. Which isn’t to say it will last that long. Consider me wishing I were Irish! For more quick breads, be sure to check out what is (seriously!) the Best Banana Bread ever, or these Easy Cheddar Onion Scones. 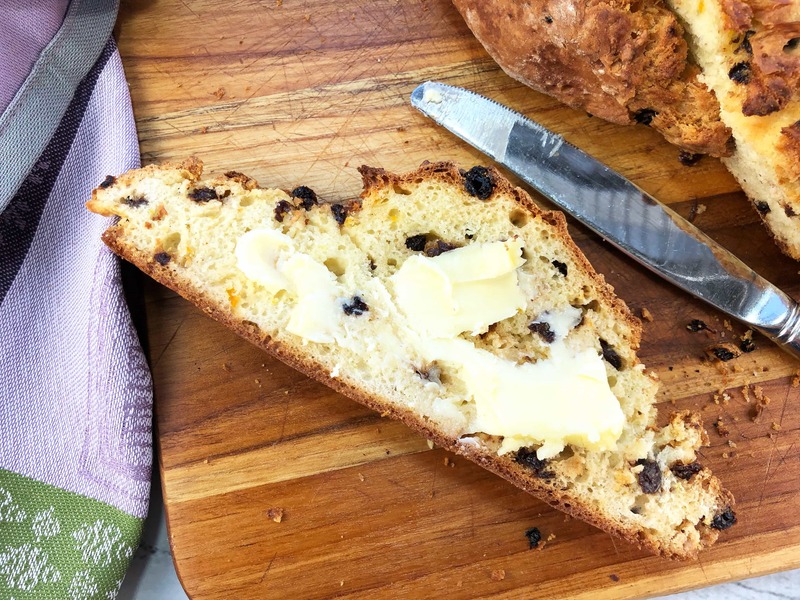 From the incomparable Ina Garten, this Irish Soda Bread is a treat any day of the year. Light and airy, studded with currants and a bit of orange zest, with a crunchy crust, it is absolutely perfect! Warmed and buttered, toasted, or just by itself, it is perfect! So easy to put together, feel free to shape it to a dome shape, cut an “X” on top and it turns our beautifully! Thanks, Ina! Preheat oven to 375F for Conventional, 360F for Convection. Prepare a sheetpan by lining with Parchment or spraying with Non-stick spray. In the bowl of a stand mixer, or a large bowl, combine the flour, sugar, baking soda and salt. Add the cubes of butter. Using a stand mixer with a paddle attachment or a hand mixer, with mixer set on low, combine until the butter is nicely mixed into the dry ingredients – about 10-20 seconds is all it takes. Into a measuring cup, measure the buttermilk. Add the egg and the orange zest, and beat lightly with a fork to combine. With mixer at low speed, slowly pour the wet ingredients into the dry. Add a tablespoon of flour to the currants, mix a bit and add the currants to the dough, being careful not to overmix. The dough will be very wet. Onto a well-floured board, dump the dough. Knead it a few times and shape into a round loaf. Using a sharp knife, lightly cut an “X” across the loaf, about 1/2-3/4” deep. Bake loaf 45-55 minutes until deep golden brown. A cake tester should come out clean and loaf should sound a bit hollow when tapped. Cool on a baking rack. Serve warm, toasted, or at room temperature. Thanks so much! Hope you love it as much as we do! Thanks for visiting! I heard a fun fact on the radio yesterday. There are 7x more people of Irish decent living in the US than in…wait for it…Ireland! Of course, that’s a trick riddle since the US population is greater than the Ireland population. Either way, I’m all in on soda bread! This version with the orange zest sounds fantastic!! What! That’s crazy! I’d really want to see the math on how that happened. I guess most of the country must’ve left during the mid 1800’s? I’m kind of stunned by that. So interesting. I guess Ancestry.com would know this! Thanks, David for the fun fact and your visit! I love currents in my Irish Soda Bread Laura! This loaf looks totally yummy! Mary Ann, I agree, Currants are wonderful in soda bread or scones, they are just the right size for a pop of flavor and texture! Thanks for visiting! I have never made anything like this, but there is something very appealing about making your own bread!I think this one would be so good french toasted, especially with that orange zest!! It would be gone in a heartbeat around this house!! You’re so right, Katherine. It makes the most excellent French toast! You’ll be so glad you made it! Thanks for your visit! Guiness for sure, Davorka! Hope you get the chance to make this. You won’t be sorry! Mmmmmm this Irish Soda Bread does look simply divine!! Love the currants in this. I am not sure if I have ever had soda bread before?! I need to make this!! Soda bread is something that once you make it, you’ll wonder why you haven’t before. This one is sort of halfway between a bread and a cake, but you can definitely toast and butter it. So delicious! 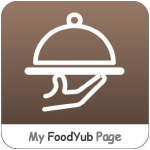 Hope you get the chance to try it! Hi, Kelly! I hadn’t made soda bread until a few years ago, and wondered where it had been all my life! So simple and so delicious. This one is a great one to start with, it’s so yummy! Laura, this soda bread looks delicious! With the currants and orange zest, it must be so addictive. Would love this for breakfast! Thanks, Kelly! It is pretty darn good. And the fact it is so easy makes it a bit dangerous, since I will likely make it on the repeat. But, that’s ok, right? A great breakfast idea, for sure! Soda bread is the first bread I learned to make as a youngster. My granny used to make soda bread a couple of times a week, but you wouldn’t have called her version Irish. So your version of Ina’s recipe is a new one for me and one I think would make a great treat at teatime. It definitely would be a great bread to serve with tea. I just love how simple it is, even if it’s not completely the traditional soda bread. Thanks, Ron, for your visit!